This slightly spicy recipe comes from the Forks Over Knives cookbook. For the most part I followed the original recipe. The chili comes out tasting a tad spicy (which I liked! ), but the texture of the squishy beans and tomatoes together is a little off-putting. 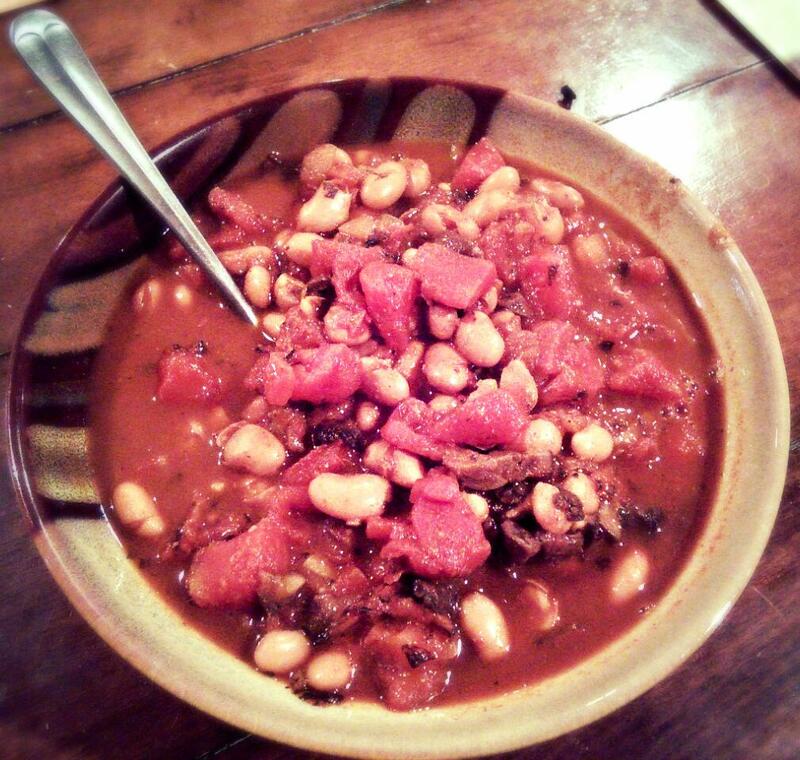 There is so much water left in the bowl it feels like more of a stew than a chili. If more water was allowed to cook out, it might resemble more of a chili. 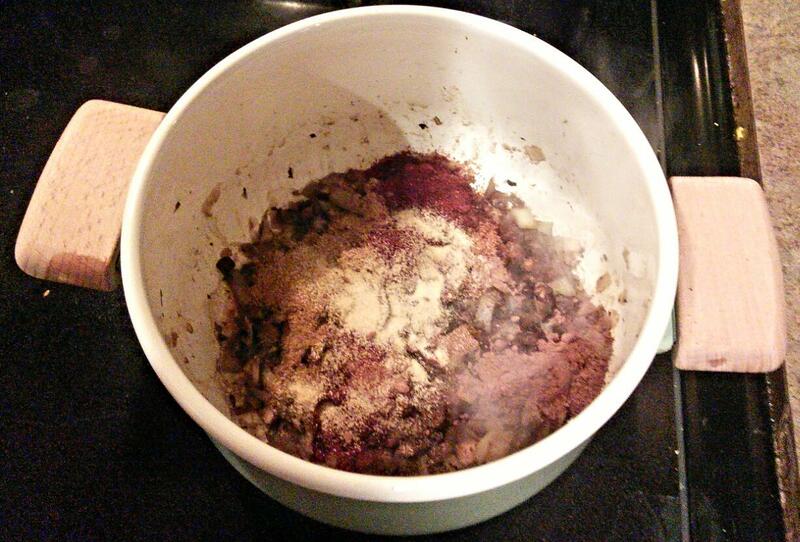 Adding black beans mixed with the pinto beans might also “firm up” the mix a little more. 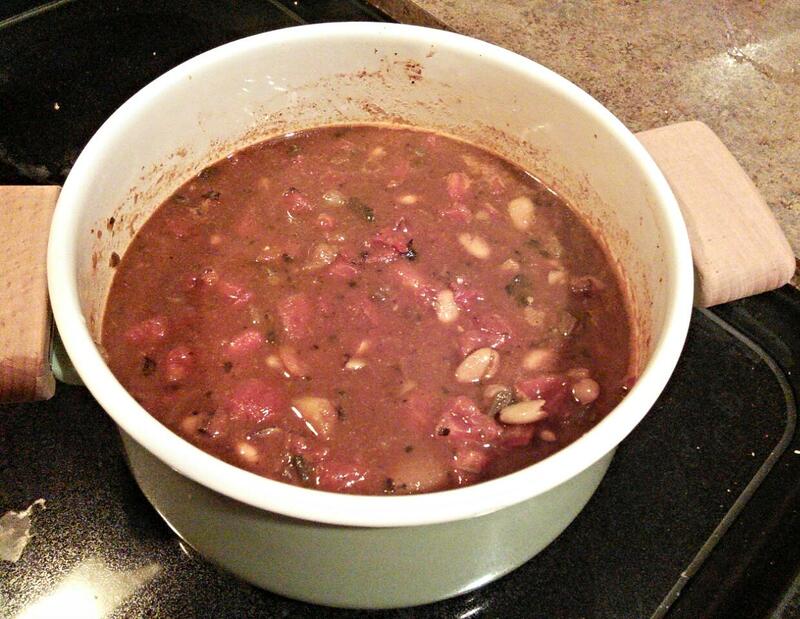 Notes: To make this more of a chili than a stew add less water. 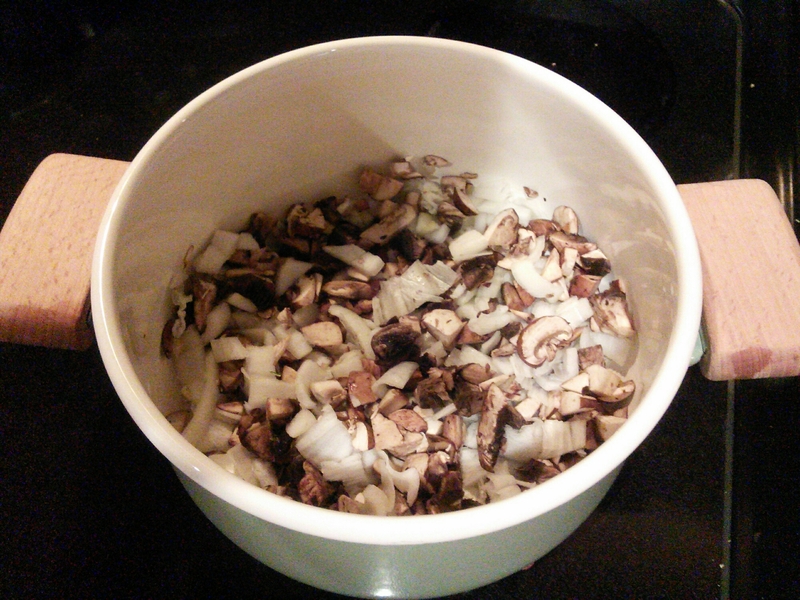 It’s a little light on the mushrooms so add more if you really want the mushrooms flavor and texture to stand out. This might make it less of a chili, but I think adding a grain would go a long way. I could see adding brown rice or serving this over whole wheat mcaraoni noodles to make it a filling, thick chili. The directions for this dish are fairly simple. First, place the onion and mushroom in a large-ish saucepan and sauté over medium heat for about 10 minutes. Add water a tablespoon or two at a time to keep the veggies from sticking to the pan. Then add all of the spices (garlic through cocoa powder), mix it up, and let it cook for another 2-3 minutes. Add the tomatoes, beans, and 2 cups of water. Simmer, covered, for 25 minutes. Season with salt (optional). I recommend using less water if you want it to be more like a chili than a stew. The picture below uses 2 cups of water to give you an idea of how much liquid you’d be adding. The next time I make this recipe I’m only going to use 1 cup of water to keep it chili-like. After 25 minutes of simmering (using 2 cups of water), this is what you end up with! It looks very good and the consistency isn’t bad. It’s a simple recipe, and a decent one, but not one of my super-duper favorites.